We know that we have come to know him if we obey his commands. The man who says, “I know him,” but does not do what he commands is a liar, and the truth is not in him. But if anyone obeys his word, God’s love is truly made complete in him. This is how we know we are in him: Whoever claims to live in him must walk as Jesus did. This is just a short little thought from a short, little brain-We all want to have faith in Jesus, but why not also desire the faith of Jesus? What in the world am I talking about? As evangelical Christians, we really want to push the idea of believing in Jesus, in Him as a person. But, what did Jesus believe in, what was his faith like, how did he live and think? It seems to me that we should strive more to have the faith that Jesus had rather than just believing in Him and thinking that is the end of the story. Many people say they believe in Jesus without really understanding who He is or what he stood for and believed in himself. How did Jesus walk? How did he live out the faith part of His life? That is what we should be striving for. Let’s try to walk and think and live like Jesus did, not just believe in or have a basic knowledge of Him. 1 John 2:6 says,”Whoever is in Him, must walk as Jesus walked”. I think that this is the “working out of your salvation” that is spoken of by Paul in Philippians 2:12. We are to live our lives out just like Jesus did, not just say we have faith in Him. Just something to meditate (see also “hagah” – Meditation – A New Perspective) on this week. The story of Jesus and his disciples encounter with the Gadarene demoniac is a story that is familiar to most of us. After being prompted by a friend to re-read it very carefully, I became aware of something that I had never noticed before. The disciples never even got out of the boat! Both Mark and Luke record it the same way. There is no written indication that they even stepped one foot on the land. Jesus got out of the boat and did all the talking and was involved by himself in all the action. What is the lesson here? First of all, you have to know something about the land of the Gerasenes. “Gerasene” means,”the kicked out ones”, and refers to the seven tribes that were expelled from the Land of Canaan when the Israelites began to conquer the Promised Land under Joshua’s leadership. The land on the “other side” of the Sea of Galilee is where tradition held that these seven expelled pagan nations went to live after they were defeated and kicked out of the Promised Land. To a Jew, it was the land of the devil, an evil place that you would certainly not want to visit. A righteous Jew would not even set foot in this pagan land. This is also most likely the “far country” that the prodigal son went to when he ran away from his father’s house (if you will remember there were pigs in both stories). The faith lesson here is huge. We’ve got to get out of the boat (our comfort zone) and get into the battle with the enemy! Jesus did a lot of training with his disciples, but he also expected them to put their training into use. He confronted the forces of evil head on as they watched. My tendency is to keep going to church and fellowshipping with my Christian friends. I use up all my “Christian time” in an inward manner and don’t even look towards the “other side”, much less take on the evil that is present there. Working with the “other side” is dirty and messy and makes you get involved in tough situations and I’m not anxious to get involved. (We might get killed!) I’ve got to get out of the boat and start putting my training to use! May God help us all as we attempt to be his witnesses to a world that is dirty and messy, but desperately in need of His message! Get out of the boat this week! As I was studying the construction and function of the tabernacle in Exodus 25, I began to think about the way we fuss when the music or invitation at the church is too long and we have to stand on our feet longer than we want to. When God designed the tabernacle and then the Temple, there were no seats!! You stood while you were in God’s presence and there was no sitting down at all! 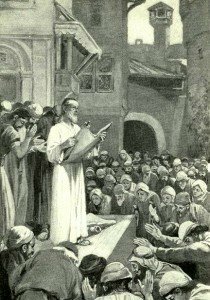 Even in the synagogue, which came much later, there were only a few seats for the chief priest and elders. The rest of the congregation stood while the service was going on and especially while the word of God was being read. In Nehemiah 8, when the Jews, returning from exile, met at the old Jerusalem Temple, they found a copy of the scroll of Isaiah. The Bible says the congregations stood from morning till evening as the word was read. God’s word is powerful-they are his “very words” to us! We should be glad to stand in his presence as a way of showing our love and respect for him and his word. To add a punctuation mark to this thought, look at the Luke 4 synagogue story and also Luke 5:1 and you will see that Jesus, himself, always stood when the very words of God were being read. He only set down when he began to teach! When you read and learn this, it kind of makes you feel ashamed that you were mumbling to yourself about having to stand too long in the service! Bless God and his very words to us! 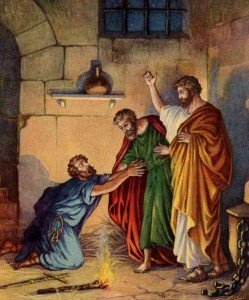 Another example of the fact that we don’t really know our text very well comes from the story of Paul and Silas being thrown in prison in Phillipi. The text says in Acts 16:25, “about midnight, Paul and Silas were praying and singing hymns to God”, when a huge earthquake came and their chains came loose and they were set free. Why would they be praying at midnight? Did they just happen to be up at that time of night? Why would midnight be a significant time for them to be praying to God for intervention? I s there something in the text that would provide and answer to that question? Look at Psalms 119:61, 62, “Though the wicked bind me with ropes, at midnight I rise to give you thanks”. They were just doing what the text told them to do!! If you want to have your ropes broken, awake and pray at midnight! I’m sure Paul told Silas “Make sure you are awake a little before midnight to start praying”. Do you think if they had prayed at 4:00 p.m., their results would have been the same? 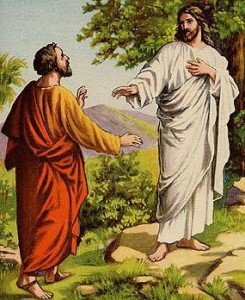 In Matthew 18:21-22, Peter asked Jesus, “Lord, how many times shall I forgive my brother when he sins against me? Up to seven times?” Jesus answered,” I tell you, not seven times, but seventy seven times.” Was that just and arbitrary number, or by using double sevens, was he trying to say, infinitely? Or, what about this possibility- was Jesus perhaps quoting the text so that Peter would recognize it? Look at Genesis 4:13-24. Cain, the first murderer in the Bible, killed Abel, but God prevented anyone from taking revenge on Cain by promising to punish seven times over, anyone who killed Cain. Cain then had a son, Lamech, who was the father of wickedness. He vowed to revenge himself seventy seven times if anyone tried to kill him. 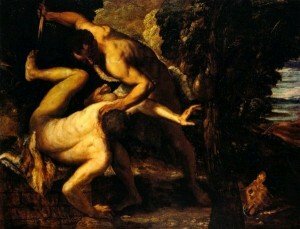 Cain and Abel were viewed by the Jews as polar opposites-Cain as evil, Abel as good. Jesus was saying to Peter, through the Hebrew Scriptures, if Cain’s side, being evil, would take revenge seventy seven times, then you musts take Abel’s side and forgive seventy seven times. If evil gets revenge seventy seven times, then you have to forgive seventy seven times. There are a thousand examples in the New Testament where we think Jesus is coming up with these new sayings, and in reality, he is just quoting the text. Our problem is that we don’t know the text well enough to realize that that’s what Jesus is doing. He was the greatest teacher to have ever lived, not only in the spiritual sense, but as a fully human being that studied and memorized the word just like we have to. He knew his text inside and out and could quote it and use it better than anyone else who has ever lived. Everything in his life was taken out of the book. Start looking for these when you read Jesus speaking and see if you can find them in the Hebrew testament. Stories like these make you want to be a better student of the text.